AirConcierge works in direct contact with airlines - no middlemen. Negotiated fares are to be sold over the phone by contract, as airlines give best online price guarantees. 'How do we make it work?' you may ask. 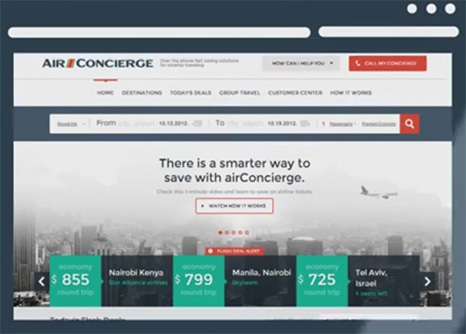 AirConcierge promises to fill up planes in exchange for better rates. The result is a win-win: full planes and happy travelers. Watch this 1-minute video to discover how it works. We are an expanding consolidator working with 5 other consolidators - the largest in the US - to offer the best deals. Added Sabre reservation system to get even more options for our clients. We opened our third overseas center – this time in Cebu, Philippines. Rated A+ by Better Business Bureau (BBB) for Excellence and reliable service. Recorded an unprecedented sales growth: 72%! After an amazing growth we exceed 500,000 clients. Became a consolidator. First direct agreement signed with Alitalia. We opened our second overseas center and launched 24/7 service. Accredited by the Airlines Reporting Corporation (ARC), we started issuing tickets in-house. Founded in San Francisco, CA by Michael and Peter. Started our own Ticket Protection program. Steep growth. Star Alliance Joint Venture agreement signed. 85 partner airlines worldwide. Moved to a new office downtown San Francisco. Launched our first online booking project. Our Product Management Team was established to negotiate private contracts with airlines. We became Better Business Bureau (BBB) accredited. Went international – opened our first office in Europe. IT Development and First Training center opened. AirConcierge has access to private fares that may not be sold online, but they are available to you over the phone. These deals can save you on average 50% over published economy fares, and up to 70% on business and first class flights. Our offline specials are exclusive and not available anywhere else. Using AirConcierge is easy and free: pick your destination and travel dates then choose from a list of lowest fares. Booking is a phone call away. AirConcierge and Atilla my representative were very helpful and a pleasure to work with. Atilla helped me all the way through the reservation process to completion. Which made my transaction easy and seamless. Thanks! Mark is very professional and had my flight figured out within minutes. Your service is excellent! This takes stress away from traveling to another country. Very helpful, great flight price, and very quick! Denzel called me back with a flight about 20 minutes after I called him. I got the cheaper than online flight including trip protection! Thank you! This is the 3rd time I am booking with your company! Lex was wonderful in being patient with me in finding the perfect flights at the perfect price! Get expert itineraries within minutes. All options are customized to match your requirements. Support before, during & after your trip. Thanks! Please, go to your inbox and confirm your email. © 2019 International Travel Network. All rights reserved.